Jiayuguan is a city named after the famous mountain pass Jiayuguan which is a part of Ming Dynasty’s Great Wall. Jiayuguan is located in the west of Gansu Province. It spans an area of 2935 square kilometers with a population 143,700, in which urban population accounts for 119,300. Jiayuguan has ethnic group such as Mongolian, Dongxiang, Yugur and they approximately makeup 44% of the total population. Yugur national minority is unique in Jiayuguan. South Jiayuguan is by the Qilian sierra while the north passes the desert. The terrain is quite flat here and the climate belongs to continental wilderness of temperate zone. Elevation is bettween1500--1800 meters (center elevation 1662 meters). Annual temperature ranges between 6.7 to 7.7 degrees. Within the boundaries year after year the iceberg thaw forms Tao Lai River which is the main water source for Jiayuguan. Jiayuguan is an important city on the silk road. Some tour attractions you can expect to see here include the well-known Jiayuguan tower over a city gate, the Great Wall's first pillar, hang wall Great Wall, the ruins of the Ming Dynasty Great Wall's feng pillar, the Great Wall museum, the new town Wei Jin mural grave, 71 glaciers, the desert Gobi scenery, and the Manjusri mountain rock cave. Jiayuguan is situated at the section of the Silk Road where it is prosperous, and the tourist attractions here are abundant. Some regard it as a convergence point of the Great Wall culture and the Silk Road culture. It has the reputation as “the world strategic pass”. 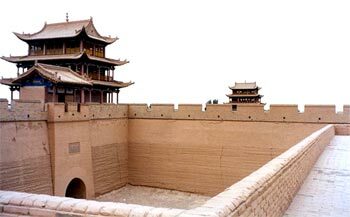 The west end of the Great Wall begins from Jiayuguan, and is also referred to as the Great Wall's first pillar (wan li chang cheng di yi dun). Other tour attractions include the “71” glaciers, the Great Wall museum, Gobi desert scenery, the desert mirage, the elegant Dan landform, and red Liulin. Jiayuguan had already held “melon festival” and “the Jiayuguan international glide festival”. Jiayuguan is located 380 kilometers away from the city of Dunhuang. Each year, Jiayuguan receives over 20,000 foreign visitors, and over 180,000 domestic tourists. If you travel to Jiayuguan, you can buy local brand of handicrafts and souvenirs such as “the desert wind”. Jiayuguan Pass is situated at place of the Hexi where the south has the snow mountain of Chilien, and the north is the rolling Mazong mountain. Hexi’s first pass has had the reputation of being the cultural exchange line and key communications line for previous dynasties. There is a widespread eulogy in Jiayuguan about an artisan in ancient times. It is said that when the Ming Dynasty repaired Jiayuguan pass, the responsible official of the project director tested the artisan by asking him difficult problems. The artisan was asked to budget the number of bricks needed for the construction. When the project was completed, only one brick remain, and this was named the “last the brick” placed on top of the pass. War broke out frequently in this area. During the reign of Emperor Mingzhengde (1515 - 1522), the Turfan (Turpan) often invaded Hexi, and pillaged the land and villages. At that time Jiayuguan was an orphaned city, and it was not difficult for the Turfan to repeatedly pillage and plunder. It was not until 1539 when the Jiayuguan project completed, and it become a strong, strategic pass. Today, after many repairs and restoration projects, Jiayuguan Pass show its youth again.